Choose the right batting cage to go along with your Heater Jr. Baseball Pitching Machine: either the 24' batting cage that is included in this package (pictured) or step up to the plate with a 36', 48',60' or 72' batting cage. Simply "add to cart" to see how much you'll be saving! This package includes a Heater Baseball Pitching Machine + the Batting Cage of your choice. The Heater Jr. Baseball Pitching Machine is the best introductory fastball baseball pitching machine on the market. Fully featured, it pitches regulation leather baseballs, baseball pitching machine balls, lite balls or wiffle balls with pinpoint accuracy. A variable 10 speed control dial lets you "dial-in" speeds from 15-46mph using any of the above mentioned balls, based upon standard Little League depth of 45' from the batter. Higher effective speeds can be obtained by simply moving the machine closer, figuring an additional 1.5mph in effective speed for every foot closer to the batter(e.g. placing the machine 5' closer would result in a top-end pitch with an effective speed of 55mph). The rugged tripod stand is made of galvanized steel tubing and the durable nylon-fiberglass housing is both lightweight and high-impact resistant. Also, included with the Heater Jr. 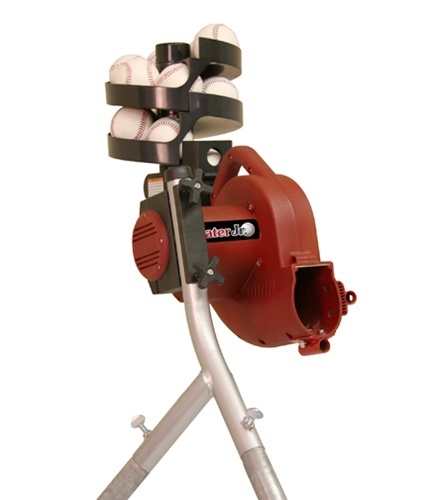 Baseball Pitching Machine is a FREE 12 ball Auto-Feeder (a $79 Value) that feeds a pitch every 12 seconds. Turn your backyard into a fully automated batting cage. Each frame section is comprised of steel tubing side supports, foam support padding, along with flexible fiberglass arching sections that flex in the wind to reduce the force associated with heavy winds. The rugged 1" square netting is so strong the Heater Home Batting Cage can be used for golf as well. Because the netting consists of 1" holes, the net provides twice as much material strength as standard 1 1/2" batting cage netting. The 6 stakes which are staked into the ground provide the foundation and support for the entire batting cage. Connect 2 or 3 batting cages together to make a 48' cage or a 72' cage respectively.